Moyee Coffee is quickly becoming the first multi-national coffee company based out of Ethiopia. In addition to utilizing the best roasting machinery in the industry, and award-winning staff, we are also developing an organic farm of the highest caliber, all to insure that our supply of supreme quality coffee never wavers. “For decades the world has enjoyed the finest of Ethiopia’s Arabica coffee, while the majority of the profit has failed to reach the farmers. My vision for Moyee is to establish the world’s first specialty coffee brand that is as equitable as it is delicious. A company that produces quality beans and still delivers fair value. 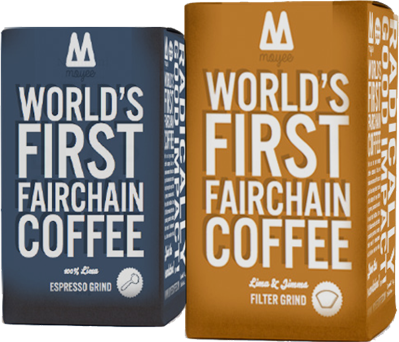 Our revolutionary FairChain practices such as local value adding activities (world-class roasting and packaging facility) and living wages, are the core aspects that make our model so innovative. Ahadu Woubshet is the Founder / General Manger of Moyee Coffee Ethiopia, the first Ethio-Dutch fairchain coffee farming and roasting company, providing high-end Ethiopian coffee to the international market. He holds joint MBA in Finance and Information technology for the University of Maryland, College Park. Before establishing his current venture, Ahadu was part of the founding management team and the Chief Operations Officer at the Ethiopia Commodity Exchange. His prior experience includes a position as Senior Director with the Fannie Mae Corporation in the US, and as a Technology Consultant for the US government and other financial institutions. Van Staveren van Dijk, Founder /General Manager of Moyee Coffee Netherlands, has more than 10 years' experience in setting up and investing in companies. His investment strategy is based on transforming undervalued companies and implementing new business models in traditional markets. As partner in Kampvuur his role is to lead projects through its first phase. dhr Van Staveren van Dijk studied Public Administration at the Leiden University and studied at the Moscow State University, London School of Economics and the Chicago Graduate School of Business. Our premium quality beans are roasted to perfection by our world-class roasting technology. Our blends are specially developed by award winning baristas and cuppers to bring out the the fruity and aromatic notes that are guaranteed to change the way you experience coffee. We invite you to come and experience the Moyee Coffee difference at our private cupping and tasting sessions. We can help you discover a whole new world of coffees. Through our partners in the Netherlands, we have become the leading internet based coffee retailers. Not only are we developing new coffee blends to share with the world, we are also developing new products locally, that are changing they way people do coffee in Ethiopia. From decaf, to instant, and expresso capsules, we have exciting new products in the works! From our new farm, products, cupping center, cafe, and coffee institute, it’s clear that the best is yet to come from Moyee Coffee.